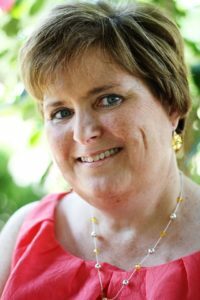 She likes to write and has done Virtual Assistant work for her clients such as writing email sequences, brochures and press releases for many of the 20+ years she has been in business. Having belonged to a writer’s group she kept hearing from writers who had books written but didn’t know the publishing process. 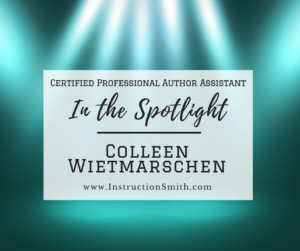 Taking the Professional Author Assistant Course and learning the publishing process provided the knowledge and skills she needed to help them move forward after they completed their book and help them publish their book. When asked for advice she’d offer someone considering becoming a Professional Author or Speaker Assistant she replied “If you really want to help writers/authors/speakers then becoming a PAA/PSA is the way to go. You have the confidence and knowledge and are a true professional to help writers/authors/speakers. In addition to the PAA courses Colleen has also taken Tina Forsyth’s Online Project Management course, completed the PR Success course by Diana Ennen, the 6 Steps to 6 Figure Success System by Donna Toothaker, a LinkedIn Profile course, and Kathleen Gage’s Marketing class. Colleen has also taken courses to be a Professional Speaker and is currently working on her 60-minute speech. This scholarship is in memory of the late Jan B. King, founder of the Professional Author’s Assistant Training Programs. IVAA is honored to partner with Janica Smith and Michelle Scappace Mack, former students of Jan’s and the new owners of the Professional Author’s Assistant Training Program to offer The Jan B. King IVAA Memorial Scholarship for Author’s Assistants. This Annual Scholarship will be awarded at the Live Summit along with IVAA’s other annual awards. 1. Free registration to the Author Assistant training value $799. 3. Free registration to IVAA’s Online Summit – value $ 97. Applications are being accepted until August 1, 2017 and is also open to Non IVAA members.